How do listening skills help your child? Strong listening abilities are crucial to children's musical learning and understanding, as well as being important in a more general sense at school. Listening is not, of course, the same as hearing - hearing can be passive but listening is the conscious process of staying focused on and getting meaning from what we hear. Aural awareness is essential to learning in music education because it helps students to develop their musical perception, memory, understanding and discrimination. Aural skills inform all aspects of musicianship, they help with both reading and memorising music and promote more stylish, convincing performances. Music develops listening skills - 'listening is necessary to hear same and different letters of our alphabet, words, sounds in our environment and musical pitches. There will be a lifetime of sounds our children will need to identify. The sooner we encourage listening skills, the more opportunities children will have to develop them'. Music helps children speak clearly and pay attention ... 'students who demonstrate beat-competence and beat-independence are the same students who perform well in all areas of the academic curriculum'. HOW CAN PARENTS HELP TO DEVELOP THEIR CHILDREN'S LISTENING SKILLS? Begin when your child is very young. Sing to, and with, your child - especially actions songs. Every parent can do this and, no matter whether you think you have a good voice, your child will love it. Have fun with music games like Guess which song I'm clapping. Explore sounds in the environment, like recognising the sound of a bus compared with a lorry and at home such as hearing the difference between banging on a little cardboard box and a big plastic box. Buy simple instruments like a little drum or tambourine, or make your own shaker from rice grains in a plastic bottle. 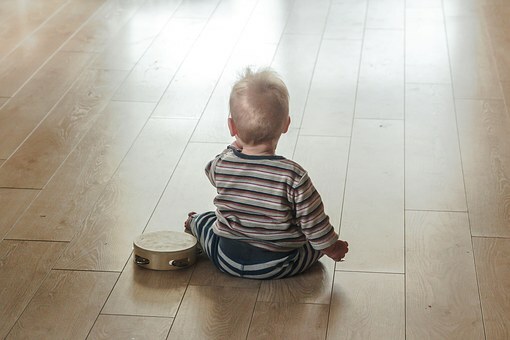 Classes that develop listening and promote music making by ear are great for very young children, for example Monkey Music which caters for children between the ages of 3 months and 4 years. The Monkey Music programme is well structured and the carefully-selected, DBS-checked tutors are trained to deliver an age-appropriate experience. The classes began in London but now run in many other areas of the UK. There are also private teachers who cater for very young children by providing small group classes suitable for parents and toddlers to attend together. Keep your child singing if you can - joining a school choir is an amazing experience that will be remembered forever. Once your child has begun formal music lessons, listening, playing, singing and music reading can most usefully go together in a well balanced, holistic way that covers a wide range of learning. You can help by providing varied listening experiences, such as taking your child to concerts or listening to music together at home. Taking your child to a wide range of concerts, including classical music ones and staged musicals will be even more beneficial if you talk with your child about what they have heard and how they felt about it. Please be aware that the volume level at all concerts, particularly amplified ones, can be loud enough to be distressing for a young child and can damage hearing - using ear plugs helps to protect your hearing as well as your child's hearing. Even if you do not have time to go to concerts, it is possible to listen with your child at home and we are very fortunate to be able to use Youtube and services like Spotify as well as radio and television. Listening suggestions may be found in the Classical 100 list, compiled in association with Classic FM, ABRSM and Decca Classics. How do teachers develop children's listening skills? A widely held theory of learning is that the development of understanding results from becoming able to internalise and use language in relation to a concept and this is something that professional music teachers bear in mind when planning lessons. Using language to focus on a concept, to describe or discuss it, promotes deeper perception and understanding of that concept. (More about learning theory here.) As an example: Claire, a five year old beginner will almost certainly begin playing the whole of a piece at the same dynamic level. The teacher will draw Claire's attention to variations between loud and quiet via practical experimenting with loud and quiet sound, for instance by making up music that represents an elephant playing with a little mouse or by making up a little loud-quiet-loud clapping sequence. The teacher will encourage careful listening to music she plays for Claire and will initiate discussion about it. Claire then begins to notice dynamics in all sorts of music she listens to and, with the teacher's guidance, starts to understand how and why to make dynamic contrasts in the music she plays. Part of developing aural skills is learning to listen with increasing understanding of the structure of music. Music teachers also make students aware of how the music is constructed; they explain elements of the music such as what time it is in (eg 3 / 4 time) and what key it is in (eg C major), how the piece or song begins and what the composer did next to develop the musical ideas. Understanding the structure of music helps enormously with learning it and with remembering it securely. Books of aural test examples are available to teachers for use in lessons. Music teachers also advise parents to subscribe their child to internet-based resources as part of their aural skills development. Choose carefully since apps can be limited in scope and free resources are predictably impoverished in quality. Karen Marshall, music educator, advisor and writer, and co-author of Get Set Piano! recommends E-MusicMaestro Aural Test Training, which is also recommended as an exam preparation resource by the Trinity College London music examining board. How are listening skills tested? Aural perception and musical understanding are both essential if a child is to develop into a good musician, and are so important that they are tested as a part of most practical music exams. Promoting musical understanding and perception is the premise on which aural testing is included as a part of music exams. To gain the best possible grade in a music exam, a candidate needs to do well in each part of it, including the aural tests. However, the really important part of aural testing is the teaching and learning that went before it. Answering questions on how music is played and constructed necessitates prior preparation that will have helped to further the student's all-round musical development, producing even better results when performing. The aural skills tested in examinations are very specifically focused so candidates who prepare ahead stand a better chance of being successful, as long as they have access to expert support. Stevens, A. 'Listen To Yourself' Music Teacher, July 2017: 29 - 31.